Another gorgeous September Saturday goaded me into a long leisurely run. 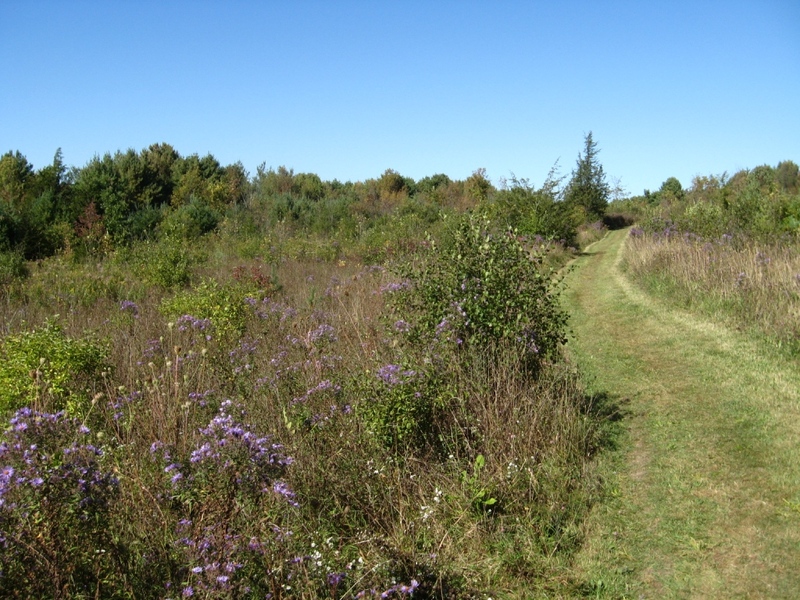 Since Sunday will be the day of the TAM team trek, a fundraiser for the Trail Around Middlebury, and family commitments will keep me away from this event, it seemed like a good day to take on a long stretch of this convenient and pretty trail. I chose to run on my favorite section, heading from town up the east bank of the Otter Creek to the Belden Dam in New Haven, returning through the forest and fields to the west. 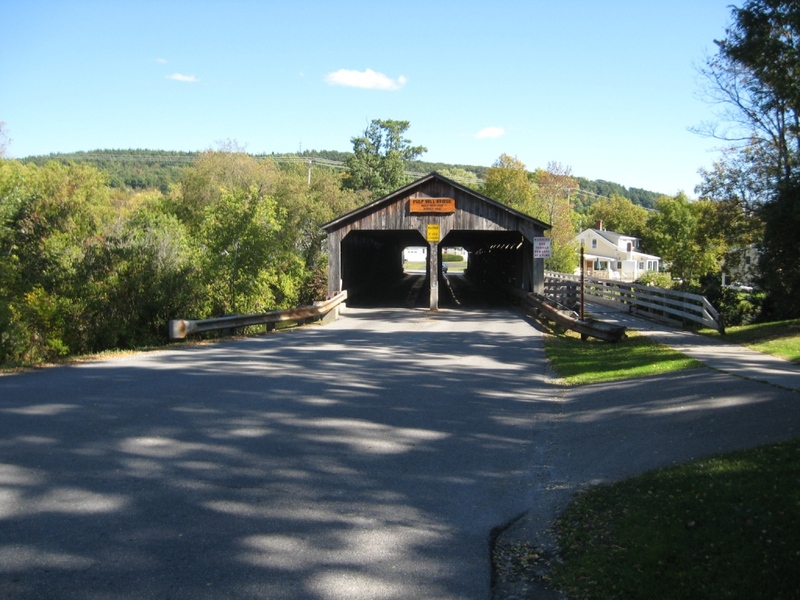 After changing into my running gear at the College Fitness Center, I headed out Weybridge Street and took a right onto Pulp Mill Bridge Road, and then another right, over the Middlebury landmark, the Pulp Mill Bridge. After enjoying the first of several attractive views of the Otter Creek on the day’s run, I immediately turned left as I came off the bridge. This dead end road passes by the old Middlebury “stump dump” on the left, where for most of my life in Middlebury, you could bury your natural yard waste. I have been told that in the more distant past, this also served as the general town dump, although this predates my experience. Nature is slowly reclaiming this site, but it still has a long way to go. At about the 2 mile point from the Fitness Center, the paved road ended, and I headed through a gate into Wright Park, the beginning of the trailed section of the TAM at this end of town. For the next mile or so, the trail wound through the meadows, with a few limited views of the creek to the left. About 10-15 years ago, these meadows were more open, but the inevitable reforestation seems to be slowly taking place with the growth of numerous small scrubby trees, and I suspect these river views will be consumed by the young forest in the next decade. After about a mile on the trail, the trail forked – the left fork headed closer to the river, but had poorer footing, while the right trail stayed higher up. I chose the right fork this time, but they do reconnect in the next mile. After a mile of fairly level easy woods running, the trail emerged into a clearing by the Belden Falls hydroelectric station at the 4 mile mark. 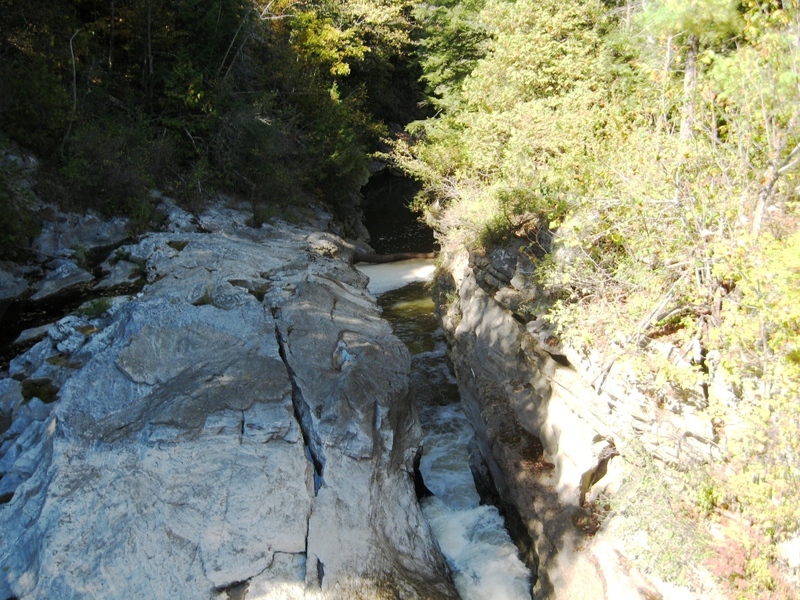 A sharp left takes you to the two short suspension bridges which span the creek over the dam, providing great views upstream to the broad dammed up Otter Creek, and downstream to the much wilder Otter Creek which shoots through a flume into the gorge. Continuing across the bridge, the trail continues through coniferous forest with soft needles underfoot, prior to passing into a farmer’s fields. On a few past runs in previous years, I have had the pleasure of meeting up with a rather large sheepdog, who, just doing his job, let me know that my intrusion was not fully appreciated. Reminding myself that he only ate coyotes, not people, I had no problem passing through this field despite his heckling. As it turns out, he wasn’t out guarding his flock today, but as I approached the stile heading into the fields, there was a small herd of cows hanging out, who were just as startled to see me as I was them. A few jumped to their feet as I approached, but I had to remind the ladies that it was not milking time as I bypassed them. 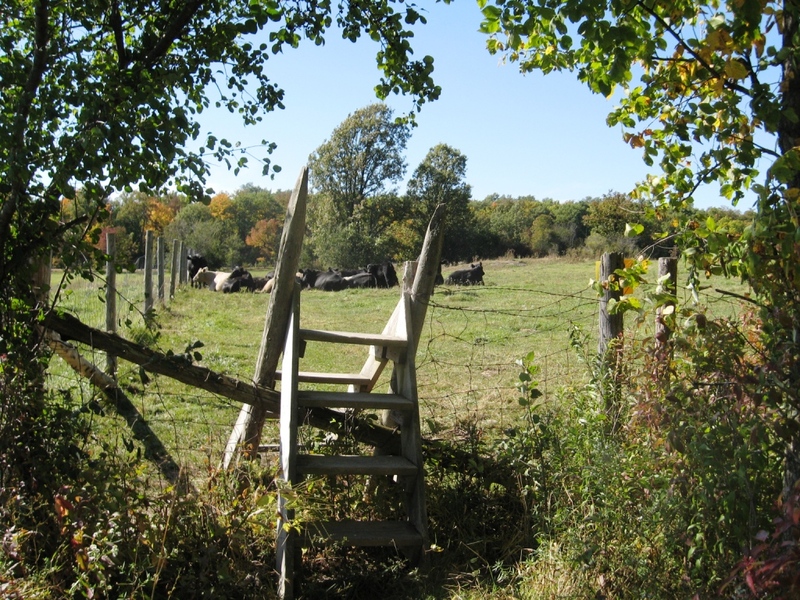 At the far end of the field, another stile led to Morgan Horse Farm Road (well north of the actual farm). 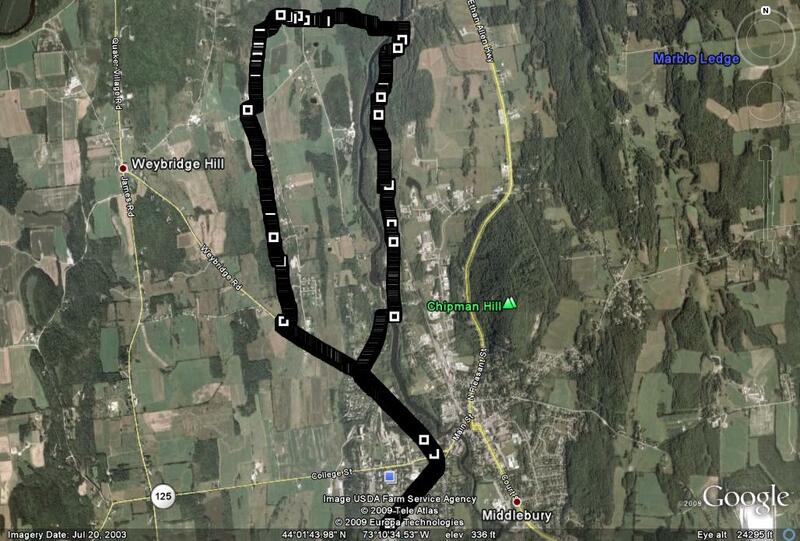 At this point, the run can be shortened by taking an immediate left, following the road back to Pulp Mill Bridge Road, and back into town. This is not a bad choice either, actually, as it does pass by the Morgan Horse Farm, which is quite pastoral when the horses are in the fields. I was feeling strong enough for a slightly longer run, however, and passed across the road, continuing on the trail. 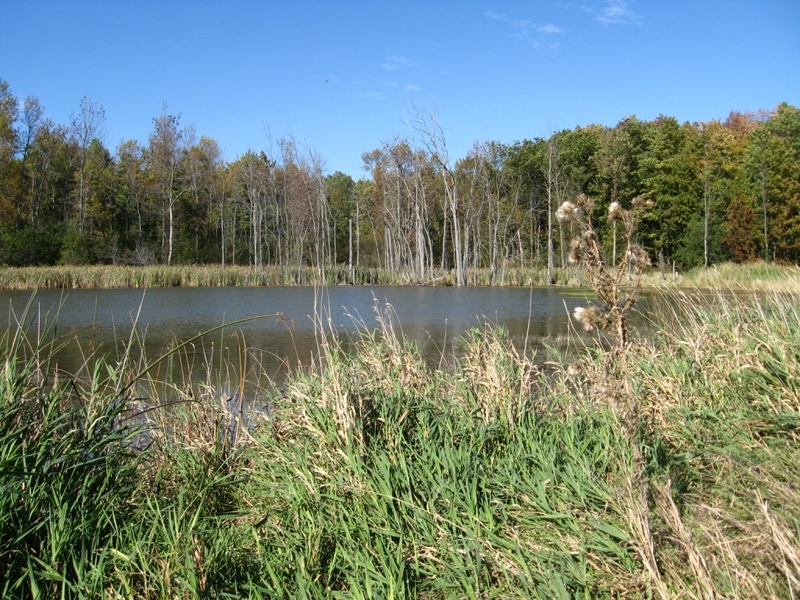 The next segment is heavily forested before breaking into open fields and passing by a small pond surrounded by rushes. The trail briefly turned right on Hamilton Road before a short steep downhill to the left, heading back into open farm meadows. As the trail reentered forest shortly thereafter, the running got pretty slow due to the fact that it zigzagged up and down a long north-south esker (any geologists out there to agree on disagree on this?) ridge on the left, with some poor footing in several sections. Finally, the trail segment of this run ended for me when I rejoined Weybridge St, just outside of town. After a few short climbs and descents, the road entered town, and led me back to the fitness center, making for a 9 mile, mostly flat run (by Vermont standards at least) run on another perfect day. Postscript: As I author this post on a lazy rainy Sunday morning at home with my kids, I am thinking of all the people traveling this stretch of the TAM as part of Middlebury Area Land Trust’s big fundraiser for the Fall. Although I was fortunate to enjoy my run on a much nicer day, I hope the weather didn’t dissuade too many people from participating in this event.